Good afternoon, Mr. Chairman and Members of the Subcommittee. 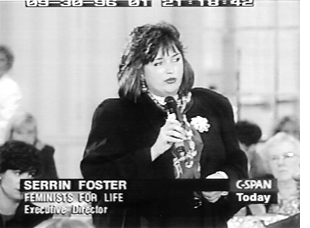 My name is Serrin Foster and I am the President of Feminists for Life of America. Feminists for Life is an education and advocacy organization that continues the work of the early American feminists who championed both the rights of women and legal protection for the unborn. Feminists for Life is a member of the National Task Force to End Sexual and Domestic Violence Against Women. As a proud advocate of the Violence Against Women Act, we applaud the universal support by Members of Congress for VAWA. I thank the Members of Congress here who have supported VAWA. We can all be proud that statistics show violence against women has decreased since VAWA was enacted. But there is much more work to be done. Feminists for Life has a track record of getting beyond deadlock on polarizing issues by addressing the root causes of the problems women face. One of the ways we do this is by listening to women and then prioritizing what women really want. Today I am pleased to speak from that perspective about an urgent question: What is the appropriate response to a woman who has lost her unborn child due to an assault that she survived? What is the appropriate response to survivors when an assault takes the lives of both a pregnant woman and the child she carries? Today’s victims are speaking loudly and clearly on this issue. We need to listen. We are hearing more and more horrible stories via mainstream media of pregnant women who are assaulted by those who do not want them to carry a child to term. • A doctor was videotaped as he tried to poison his pregnant fiancée. • Another doctor attacked his girlfriend’s abdomen with a needle. • A number of women have tried to kill the unborn child of another woman who is involved with the same man. • Unwilling fathers have hired thugs to intentionally kill the unborn child. For every story we hear, there are countless more that go untold, such as the story of Marion Syversen, a board member of Feminists for Life, who lost her unborn child when her abusive father threw her down a flight of stairs when she was pregnant. Women who have survived such unthinkable violence are unequivocal: justice demands recognition of and remedy for both their assault and the killing of their unborn baby. The Unborn Victims of Violence Act would support justice for women who lose children as the result of a federal crime of violence. Many women do not survive such crimes, and their grieving survivors are equally unequivocal: justice demands recognition of and remedy for the killing of both victims, the woman and her unborn child or children. The gruesome and well-publicized case of Laci Peterson and her unborn baby, Conner, prompted Americans to examine their own convictions on this issue. The American people, too, were unequivocal. They recognize and mourn the loss of both mother and child. According to a Newsweek/Princeton Survey Research Associates poll released June 1, 2003, 84% of Americans believe that prosecutors should be able to bring a homicide charge on behalf of a fetus killed in the womb. This figure includes 56% who believe such a charge should apply at any point during pregnancy, and another 28% who would apply it after the baby is “viable,” i.e., of sufficient lung development to survive outside the mother. Only 9% believe that a homicide charge should never be allowed for a fetus. Feminists for Life and our partners in the Women Deserve Better® campaign support the Unborn Victims of Violence Act because it would provide justice for the victims of federal crimes of violence. As victims, survivors, and the American people clearly demand, the Unborn Victims of Violence Act would recognize an unborn child as a legal victim when he or she is injured or killed during the commission of a federal crime of violence. An “interruption?” That implies something temporary, as if it were possible for the victim’s pregnancy to start back up again. Dare we ask: mother of whom? Motherhood is neither protected nor honored through the proposed Motherhood Protection Act. Instead, it tells grieving mothers that their lost children don’t count. It ignores these mothers’ cries for recognition of their loss and for justice. It is a step backward in efforts to reduce violence against women. Ten days ago in the Bronx, a 54-year-old man allegedly kicked and punched his 24-year-old girlfriend in the abdomen. Julie Harris was nine months pregnant at the time. She went through labor only to deliver stillborn twins. The Motherhood Protection Act, which some call the single victim substitute, would only recognize one of these three victims. I hope that every legislator will clearly understand that adoption of such a single-victim amendment would be a painful blow to those, like me, who are left alive after a two-victim crime, because Congress would be saying that Conner and other innocent unborn victims like him are not really victims — indeed, that they never really existed at all. But our grandson did live. He had a name, he was loved, and his life was violently taken from him before he ever saw the sun. The application of a single-victim law, such as the [Lofgren] amendment, would be even more offensive in the many cases that involved mothers who themselves survive criminal attacks, but who lose their babies in those crimes. I don’t understand how any legislator can vote to force prosecutors to tell such a grieving mother that she didn’t really lose a baby — when she knows to the depths of her soul that she did. A legislator who votes for the single-victim amendment, however well motivated, votes to add insult to injury. The advocates of the single-victim amendment seem to think that the only thing that matters is how severe a sentence can be meted out — but they are wrong. It matters even more that the true nature of the crime be recognized, so that the punishment — which should indeed be severe — will fit the true nature of the crime. This is a question not only of severity, but also of justice. The single-victim proposal would be a step away from justice, not toward it. For example, if Congresswoman Lofgren’s legal philosophy was currently the law in California, there would be no second homicide charge for the murder of Conner. The Unborn Victims of Violence Act would also avoid multiplying the pain of survivors of horrendous federal crimes of violence such as the bombing in Oklahoma City or the terrorist attacks of September 11, 2001. After years of trying to have a child, Carrie and Michael Lenz, Jr. were overjoyed to learn that she was carrying their son, whom they named Michael Lenz III. Carrying a copy of the sonogram, Carrie went to work early the next morning to show coworkers the first photo of baby Michael. She and Michael were killed, along with three other pregnant women and their unborn children, when the Alfred P. Murrah Federal Building exploded on April 19, 1995. This father’s agony was multiplied later when he saw that the memorial named only his wife, not his son, as a victim. In the eyes of the federal government, there was no second victim. Timothy McVeigh was never held accountable for killing Michael Lenz’s namesake. If the legal system does not recognize the loss of the unborn child, it becomes an unwitting agent of the perpetrator who robbed the survivors of the child and the life they would have had together. It is also worthwhile to note that outside the context of abortion, unborn children are often recognized as persons who warrant the law’s protection. Most states, for example, allow recovery in one form or another for prenatal injuries. Roughly half the states criminalize fetal homicide. Unborn children have long been recognized as persons for purposes of inheritance, and a child unborn at the time of his or her father’s wrongful death has been held to be among the children for whose benefit a wrongful death action may be brought. Federal law similarly recognizes the unborn child as a human subject deserving protection from harmful research. Some have questioned whether it is reasonable to apply this law if the perpetrator is unaware that a woman is pregnant, especially if she is in the earliest stages of pregnancy. Neither the Unborn Victims of Violence Act nor the Motherhood Protection Act makes a distinction about the age of the fetus. But would anyone seriously suggest — especially those who advocate a right to privacy — that it is a woman’s responsibility to disclose her pregnancy to a potential attacker or murderer? Knowing this may serve as a deterrent to future attacks on women of childbearing age. We cannot tell grieving mothers like Tracy Marciniak, who testified here today, that her son Zachariah didn’t count. We cannot tell Julie Harris, mother of twins, that there was only one victim when there were three. We cannot tell the families of Laci and Conner, or Carrie and Michael III, that they have only one loss to mourn. The Motherhood Protection Act would deny these victims the recognition and justice they deserve. Women have spoken. Women want the justice promised by the Unborn Victims of Violence Act. We are asking our elected representatives to honestly answer the question in the case of Laci Peterson and baby Conner, was there one victim or two? Those who support the single-victim substitute would deny women justice. On behalf of women and families who have lost a child through violence, a father who has lost both his wife and child through terrorism, and Laci and Conner’s family, I urge unanimous support for this bill, not the single-victim substitute. Click here to read Congressman Steve King’s response to FFL President Serrin Foster’s testimony.